This recipe is so healthy that it kind of hurts... my sweet tooth because I ate SO many of these dang things! I can never quite justify buying or eating Oreos despite their supposedly 'vegan' status because they contain non-sustainable palm oil and I'm not about deforestation and destruction of valuable habitat for hundreds of animals. No thank you! 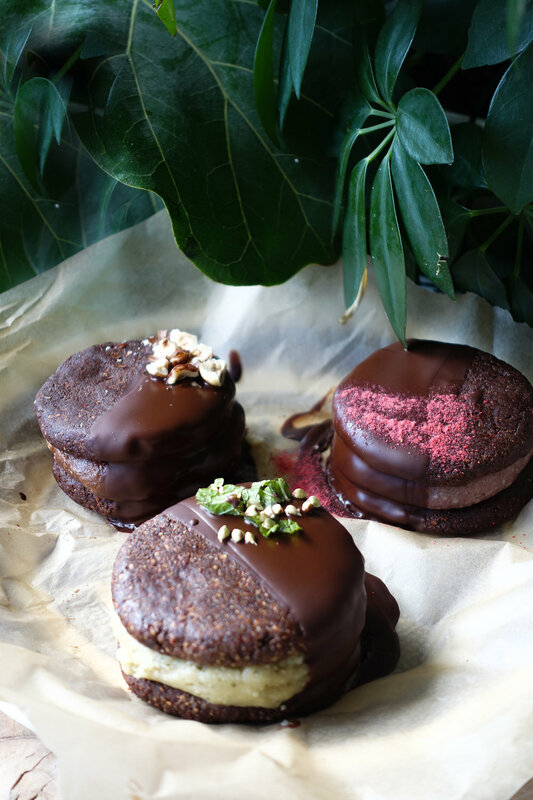 These are fudgy, chocolate-y, nourishing, and full of amazing raw and activated ingredients from Little Bird Organics' Pantry Staples range. Yum! However, if you leap into this recipe expecting it to taste just like a baked, white-sugar-laden, refined cookie then you will be sorely disappointed. This is more like a raw dessert in the shape of a tasty Oreo cookie - inspired loosely, if you will. This flavour reminds me of a delicious after-dinner mint, or a peppermint pattie, but more substantial. I decided to use fresh mint as I love the more subtle flavour, and prefer not to use packaging where I don't have to. It comes up a lovely green colour with no other additions, making it the perfect festive treat to share after a tasty meal! 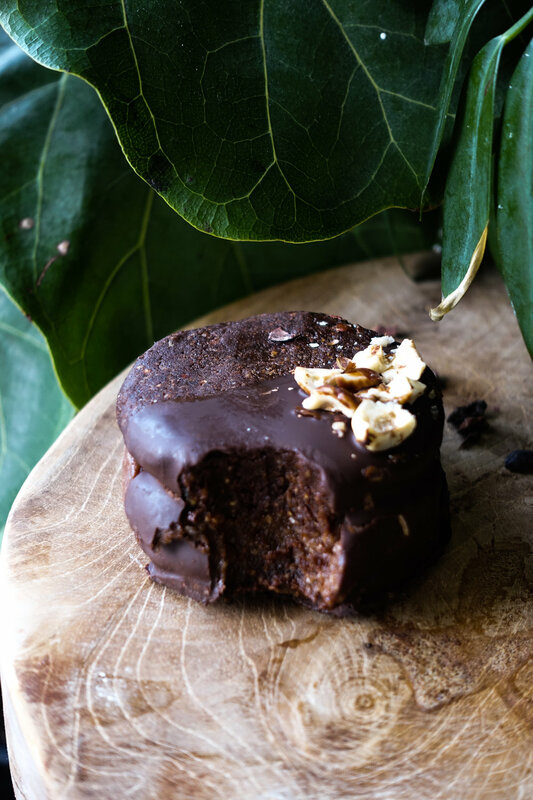 The buckwheat and cacao nibs give it a characteristic peppermint crunch, setting it apart from the other flavours and giving it a more intense bite. Inspired by the classic Nutella spread, this hazelnut and chocolate delight packs a whole lot of good fats, dark chocolate and of course, nutty flavour. Will probably make you want a spoonful of hazelnut spread... at least I did! Reminiscent of a strawberry-filled chocolate from a box of Roses according to my boyfriend, this pretty-in-pink concoction adds a fruity twist to the classic raw chocolate cookie combo. I recommend serving with a bowl of fresh strawberries and dark chocolate for dunking, but that's just me, and I am an extravagant woman. You can find more information on their website, or instore at one of their Unbakeries. Little Bird is my absolute favourite wholefoods brand (and has been for quite some time), and after using their very own ingredients I can say with utmost certainty that they are of incredible quality and of course, are DELICIOUS! Thank you kindly to Little Bird Organics for providing the ingredients for this recipe from their new Pantry Staples range - delicious! This post is not sponsored. I made my raw Oreos especially large both because I underestimated how large they would be once I filled them AND I really love a giant cookie! However, if you make them half the size, each batch will make sixteen regular-sized raw Oreos. Delicious! Firstly, choose which flavour of cookie you'd like to make! Prepare your dates by checking for any pesky pips, then soaking in warm water while you continue. Make the raw cookie dough by adding the nuts, seeds and/or buckwheat to a food processor and pulsing until relatively fine. 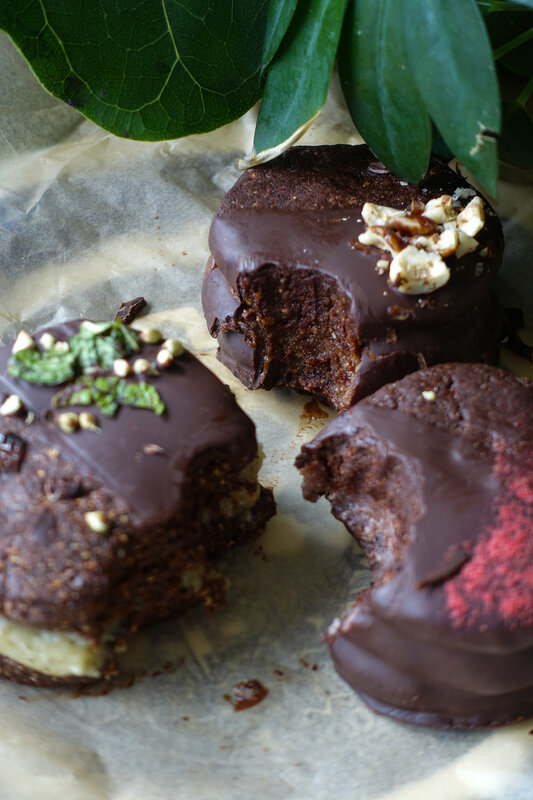 Drain your dates and add them to the food processor with the cacao powder, blending until a sticky dough forms. You can either divide the dough into sixteen even balls and shape with wet hands like I did, or roll the dough out with a rolling pin and cut with a cookie cutter - the choice is yours! The former will clearly look a little more rustic, but if you're into that then go for it. Set the shaped cookies in the refrigerator to chill while you make the filling. Rinse out your food processor, then add the cashews, maple syrup, salt and additional flavours relevant to your choice. Blend for a few minutes until the mixture is smooth, creamy and of a fluffier consistency as opposed to stodgy or dense. Take your chilled cookies and dollop even spoonfuls of the cashew filling mixture into the centre, then place another cookie on top and press down until the filling is visible from all sides. Place back in the refrigerator to harden. Make your raw chocolate to coat by melting it together in a double boiler until completely liquid. Pour your molten raw chocolate into a relatively narrow container (with an opening wide enough so that you can dunk your cookies). Dunk your cookies! I did mine half dunked half not, but you can completely coat them for a wagon-wheel effect or alternatively drizzle the chocolate over the top. Place in the refrigerator to set before dunking two more times. On the last time, place your toppings on your cookie before placing in the fridge so it can adhere to the chocolate. Voilà - enjoy your raw Oreos!